Hey guys! I'm back with another Design Clips Video! A couple of things: I promise to TRY to get better lighting. I promise to TRY to upgrade my camera from a 740HD to 1080HD. And I promise to not be so serious. Ugh. Do you ever watch yourself on video and think, "Who is that?" "What happened to my personality?". I think I'm loosening up some, but still some progress to be made. If you know me, you know that I am rarely serious. OK, enough babbling. Here's a look at the cards, yes 2 cards, I will be making. Thanks for stopping by today and I hope you have a wonderful weekend! I have been out of town for a couple of days and boy do I have some catching up to do! Don't worry, order fulfillment and shipping carried on as usual in my absence. However, if you are waiting on a personal response from me for anything, I should be able to get all caught up in a couple of days. Thanks in advance for your patience, and I apologize for the delay. I hope you all had a wonderful week. I can't wait to do some blog hopping and catch up on what I've missed in blog land! Labels: Inside The Studio, Misc. Edited to add: For those of you that requested additional file formats, you can download the .ZIP file here. The .ZIP file includes the following formats: .PNG, .STUDIO, .AI, .PDF, and .SVG files. Once you have downloaded and saved the file to your computer, right click on the zip file and choose "Extract All" (WinZip) and follow the prompts. 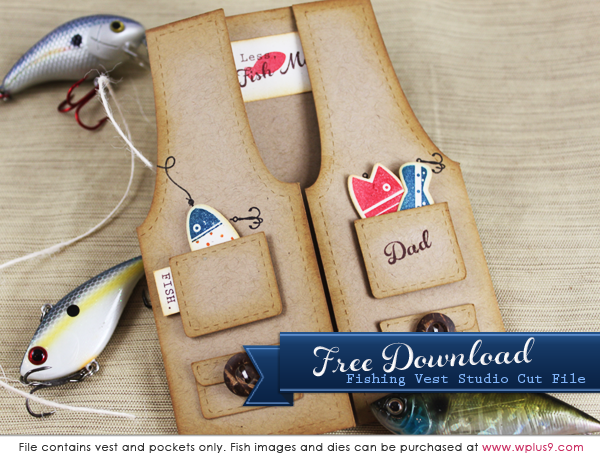 Many of you asked where you could find the fishing vest cut file I featured during the Release last week. I created it in Silhouette Studio, and thought I would share the .studio file as a free download. To download, click on the photo above or here and follow the prompts to save the file to your computer. Free for personal or publication use only. 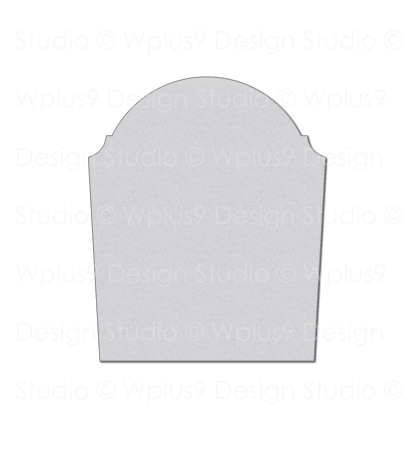 All we request is that you credit Wplus9 Design Studio in any supply lists. Enjoy! It's Release Day! All of our June/July 2012 products are now available for purchase at www.wplus9.com. If you missed the release, you can start here to catch up. Jean has presented us with a little beach in a bottle. Love all of the texture and color she's brought. Featuring: Fish More, Fresh Preserves, and the Guiding Light Companion Die. What a fantastic color combo! And the addition of pearls and lace are perfect for this Southern Charm. 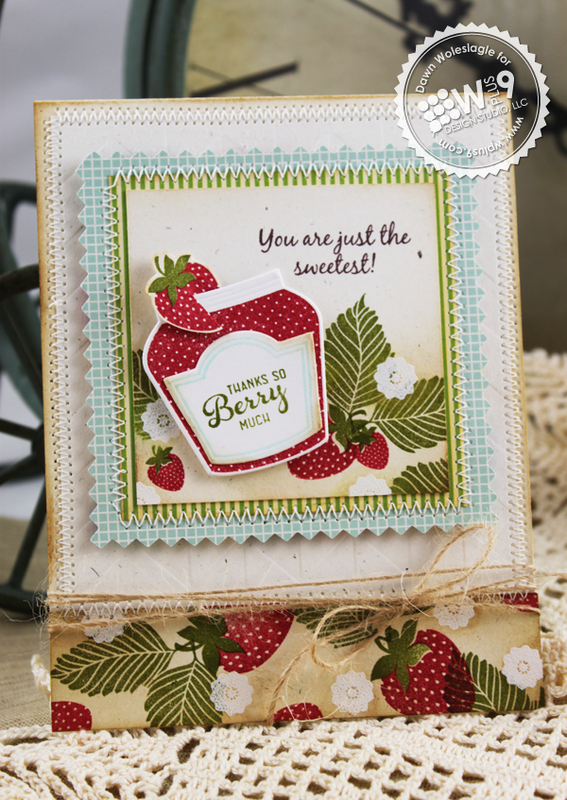 Featuring: Fresh Picked stamps and dies, and Fresh Preserves stamps and the Preserves Jar Die. 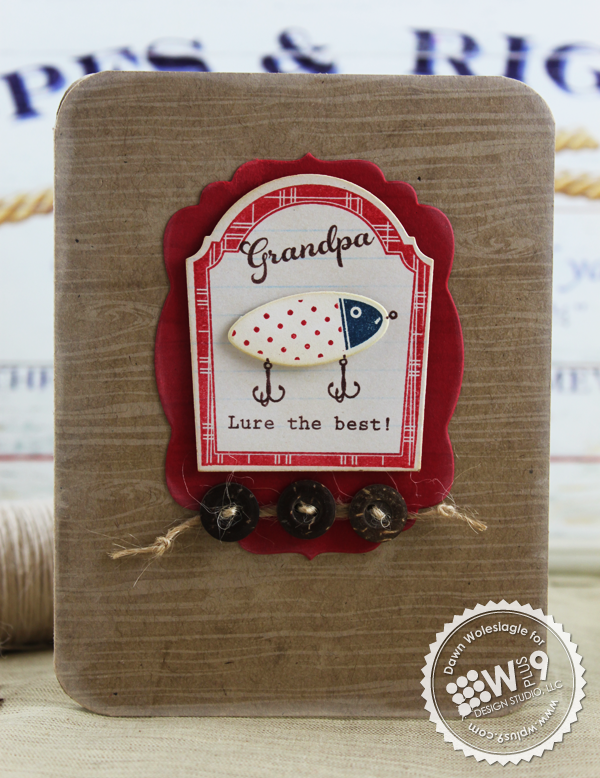 I love the vertical panel Jinny created to showcase the vintage lures. Her vertical sentiment placement is perfect for her layout. Featuring: Fish More stamps. This card is just too sweet for words. 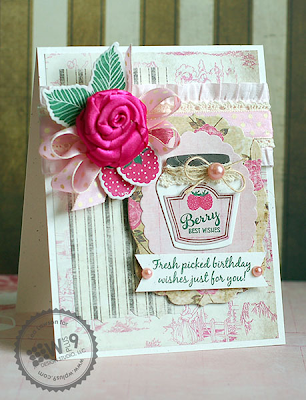 The beautiful paper, the sweet jar, and that perfectly accented rosette! The die cut leaves look like they made for that rose. 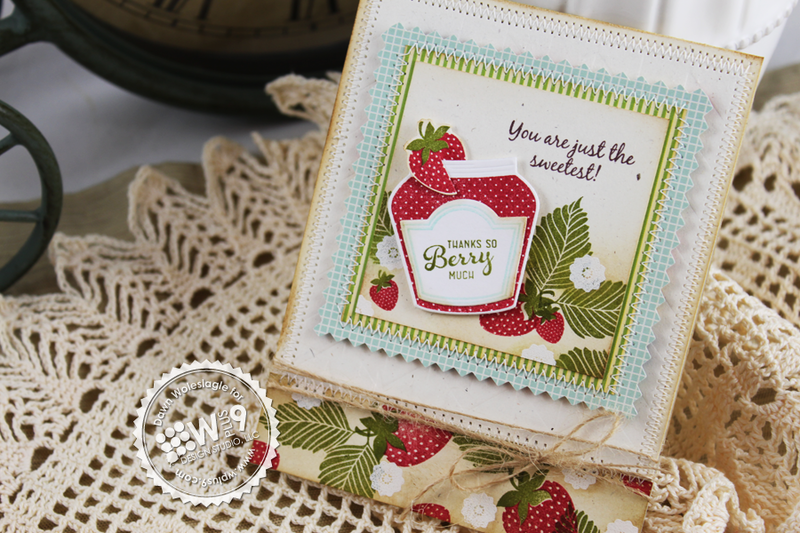 Featuring: Fresh Picked stamps, Fresh Picked Die, Fresh Preserves, the Preserves Jar Die, the Scalloped Oval Die, and Label Layers 2. 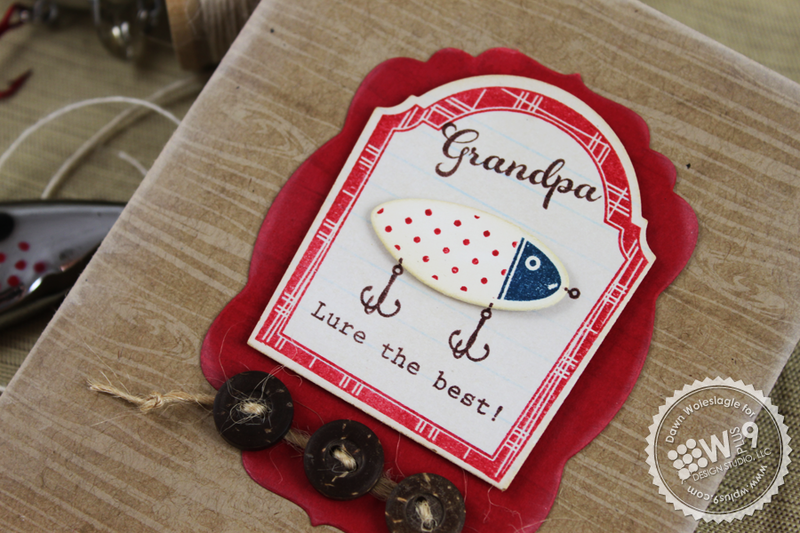 Check out the nostalgic label Elise has created! I always love the way she finds truly innovative way to combine images and techniques to make a set really come to life. Featuring: Fresh Picked, Woodgrain Silhouettes, the Label Layers 5 Die, Defining Words, and Banner Trio Die. Simple and sa-weet! 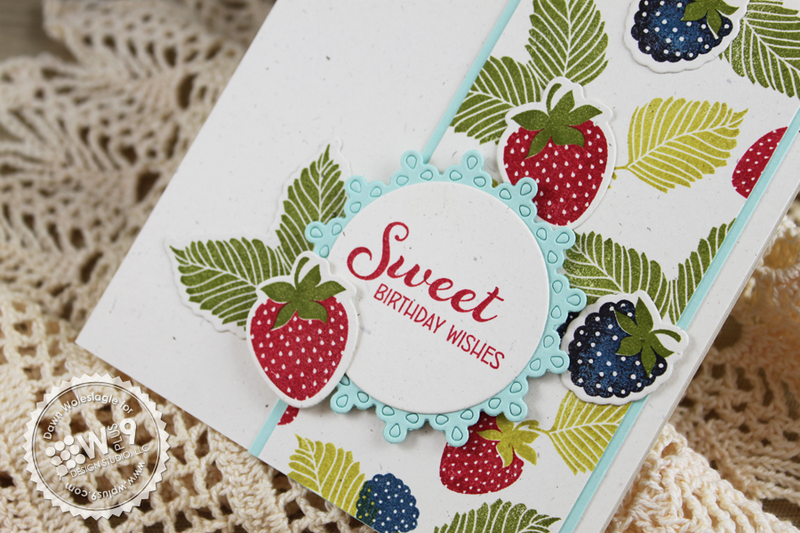 The colors and balance are amazing, but my favorite part of this card is the glossy accents Cristina added to her fruit. It looks as if you could pluck them right off of the card and eat them! 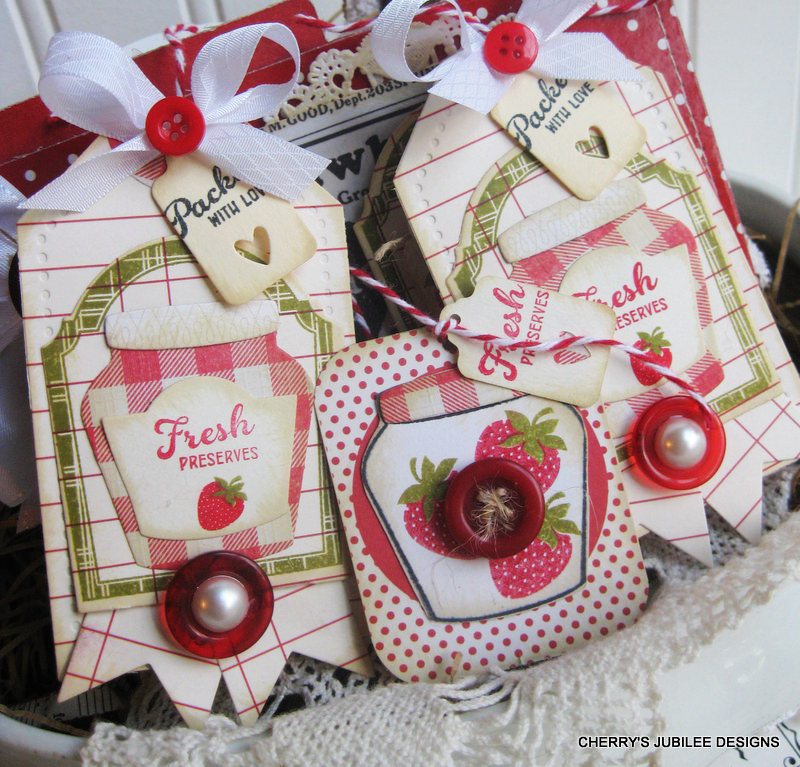 Featuring: Fresh Picked, Fresh Picked Dies. This card just makes me smile! It reminds me of One Fish, Two Fish, Red Fish, Blue Fish. Simple, simple joys. Featuring: Fish More, and the Fish More Die. I have been so delighted to have Cherry join us this month! She dove right in and really showed these sets to their fullest potential! I am so grateful that she not only produced such lovely work, but that she said she enjoyed the sets so much. That's what this hobby is all about! By the way, we had a scheduling conflict for the Fish More set, so she is posting those samples today. Trust me, you will want to head over to see them!. 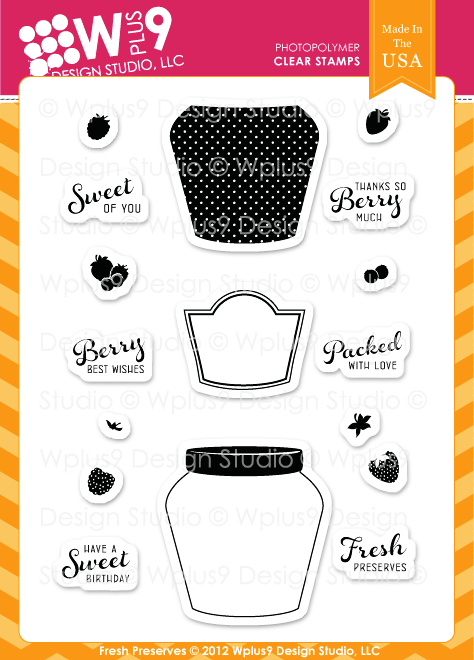 Featuring: Fresh Picked, and the Preserves Jar Die, and Label Layers 5 Die. Thank you so much ladies! I appreciate all of the work you all put into each and every release. If you haven't seen the rest of the Design Team's samples from the week, be sure to click on their names to check them out. Thanks to those of you who joined us this week and for taking the time to leave such kind and encouraging comments! We also have a die shipment expected this week, so keep an eye out for a stock update. Thanks again! It's time for the full reveal! Time to show you the sets we are releasing this month in their entirety. All products will be available for purchase tomorrow, on June 5th at www.wplus9.com. I hope that you all have enjoyed the previews. As always, I want to thank you for joining us for another release and for your sweet comments! How about one more giveaway? Want to win the entire release? Just leave a comment by 10:00 PM EST TONIGHT June 4th to enter. I will select one random winner from all comments. Winners will be posted here by 11:00 PM EST. That's four chances to win! Good Luck! 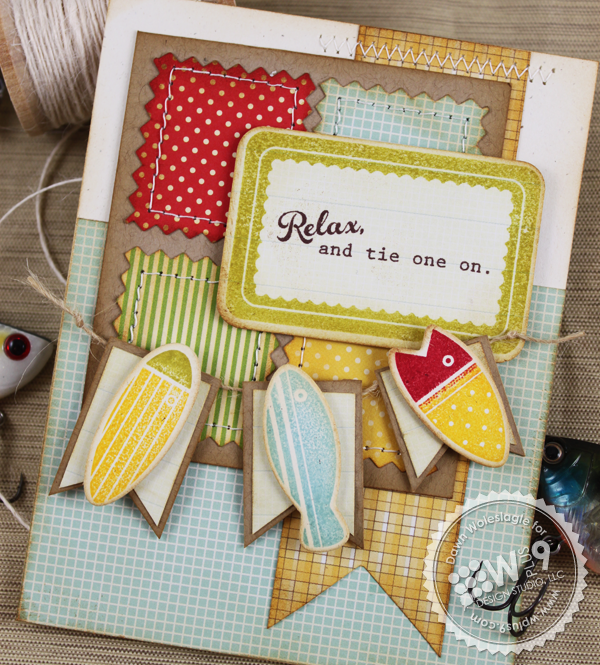 It's day 3 of our June/July Release and we have one more stamp set and two dies to share with you. It's time to switch gears and think a little bit more rustic, a little bit more masculine. If you are just joining us, you can catch up here. 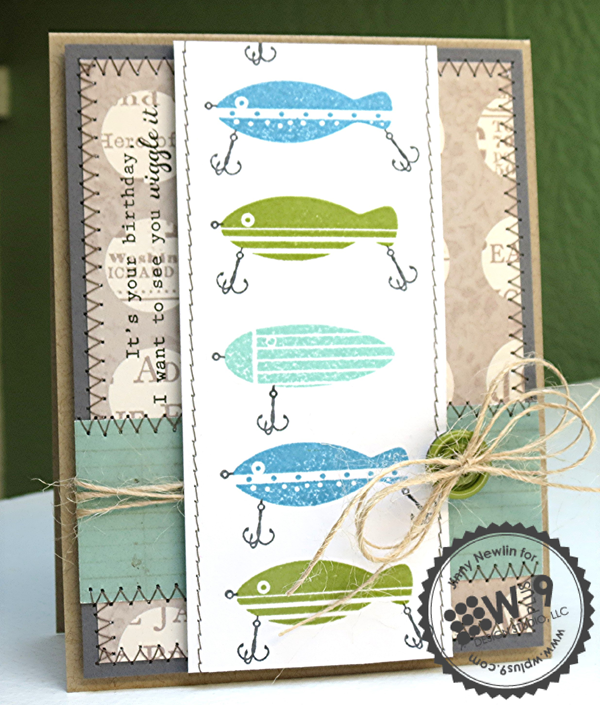 Today's stamp set is my personal favorite of the release, Fish More. I had the most fun I've ever had creating masculine cards with this set. And...it has coordinating dies! We are also releasing another die for one of our previously released stamp sets, Guiding Light! 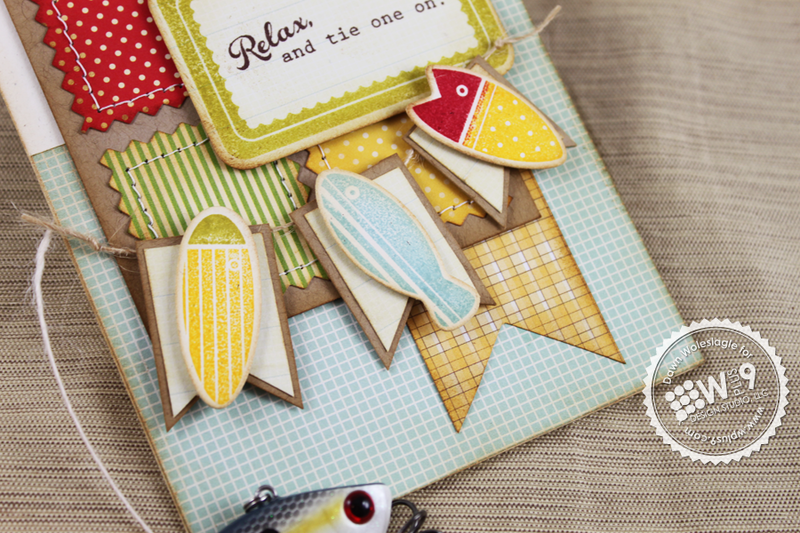 Fish More is a fun set that allows you to create custom vintage fishing lures, perfect for those angler's in your life! 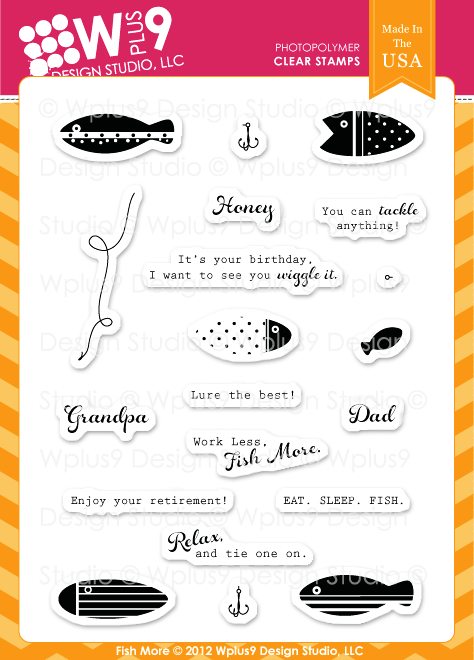 The sentiments range from birthday to retirement and anything in between. 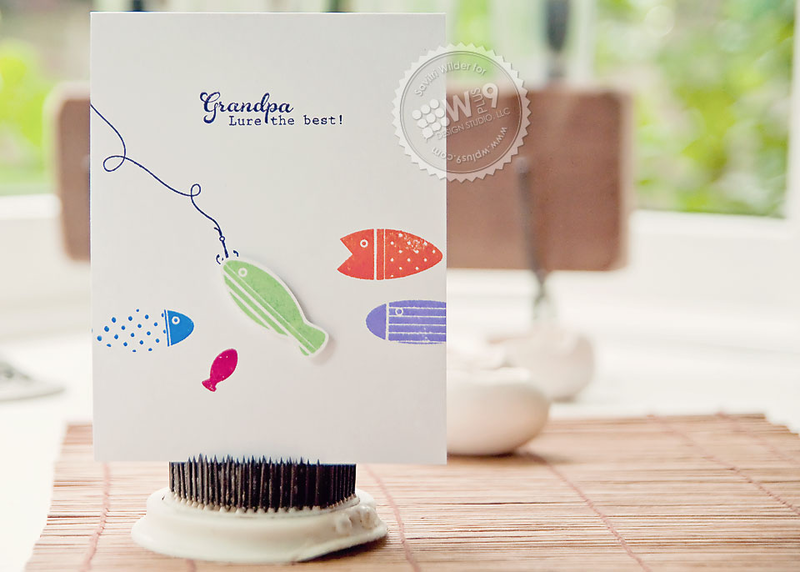 For my first card, I've created an any occasion card for "Grandpa". 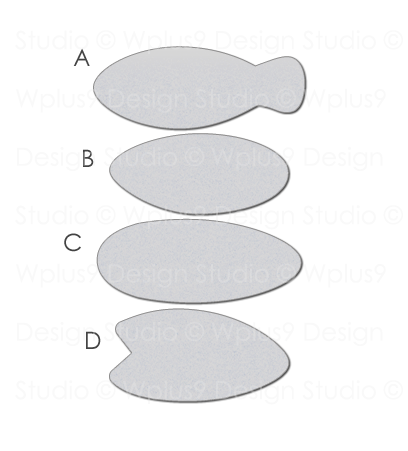 For the focal image, I die cut one of the fish using the Fish More Companion Die and stamped him with his coordinating image. 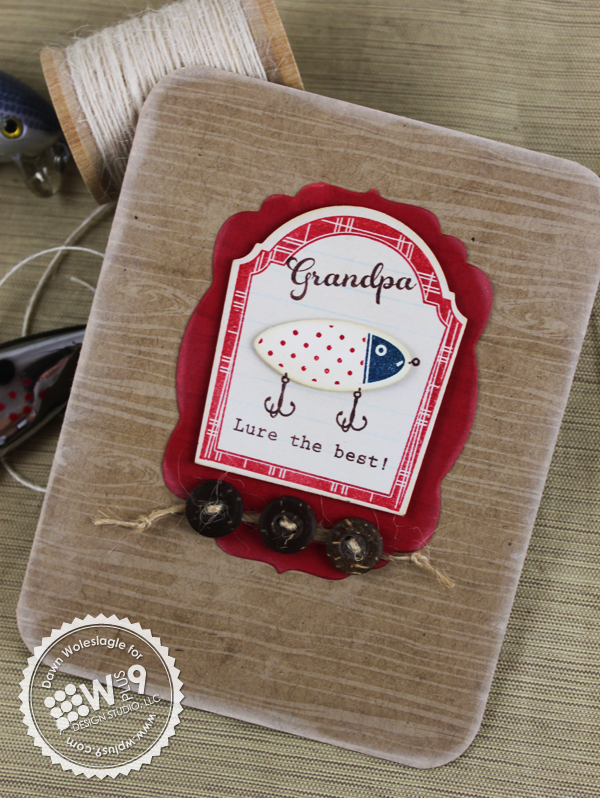 I mounted him on a Label Layers 5 Die cut that I stamped with the frame from Fresh Picked. 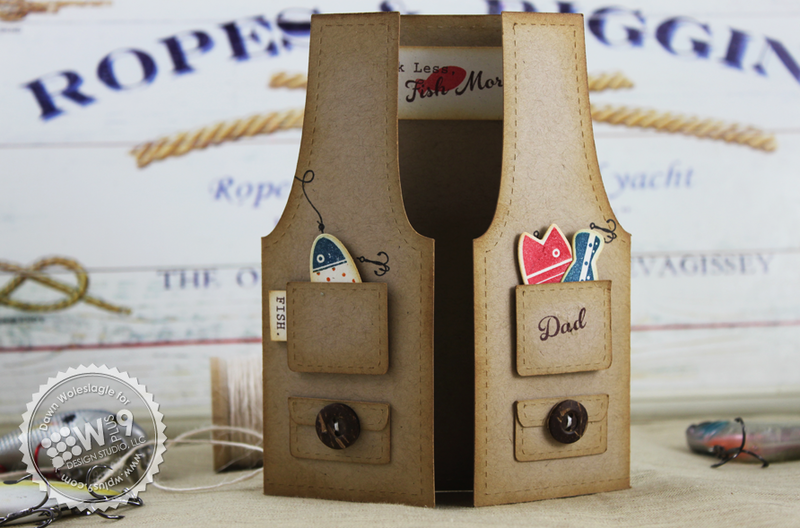 I added the little hooks and sentiments, all included in Fish More. This was all mounted on our Label Layers 2 die cut and adhered to our Kraft cardstock stamped using the woodgrain pattern from Woodgrain Silhouettes. My next card is actually quite gender neutral. Because, I don't know about you, but I love to fish too! Actually, swap out the sentiment, and this would make one cute baby card. I created the sweet little banner of fish, by die cutting several of the fish shapes and stamping them with their coordinating images. I adhered all of them to a few hand cut banners and strung them all together with twine. I added the "Relax and tie one on!" sentiment to a label cut with our Label Layers 4 Die and stamped with the Label Layers 4stamp set. OK, this next one is my husband's favorite! 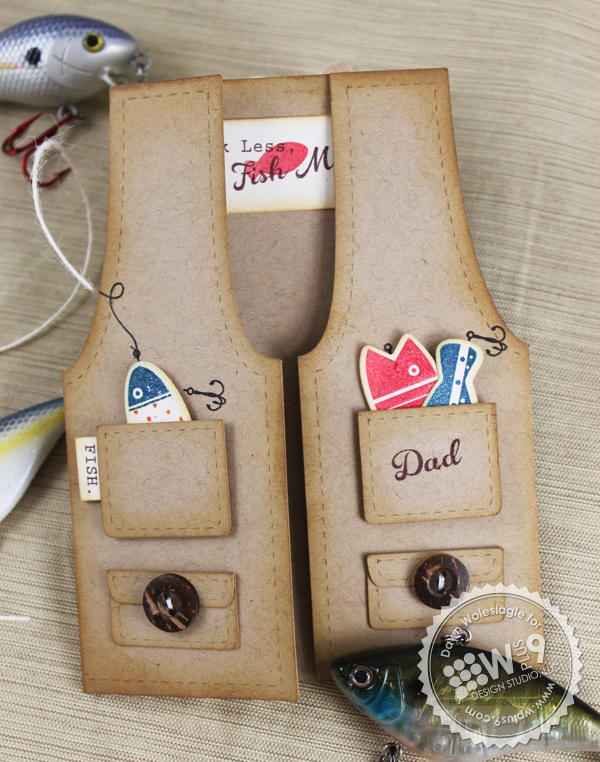 I couldn't resist breaking out the Cameo and creating a little fishing vest. It turned out so cute! After all of the pieces were cut out, I inked all of the edges and put the pockets together. 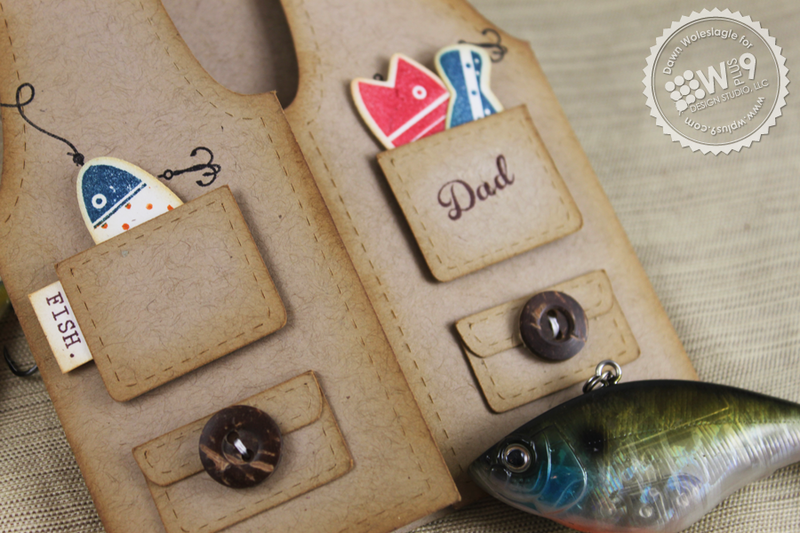 The little fishing lures were perfect to tuck into the pockets. And I even added a little stray line of fishing line. You have to have a clothing label inside the vest, right? 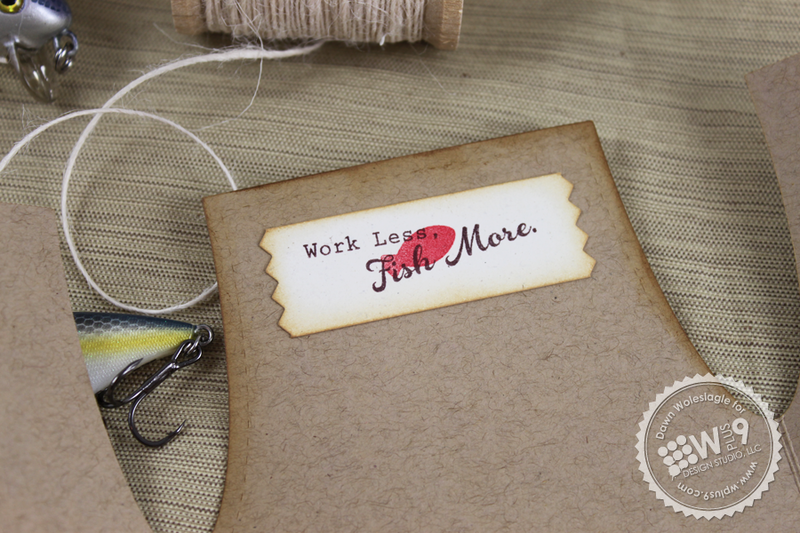 So I added a small solid accent fish and the "Work Less, Fish More" sentiment (both included in the set) to the inside. I think I will have to make another one of these in pink as well. How fun would that be? Now we get to revisit one of my all time favorite stamp sets, Guiding Light. 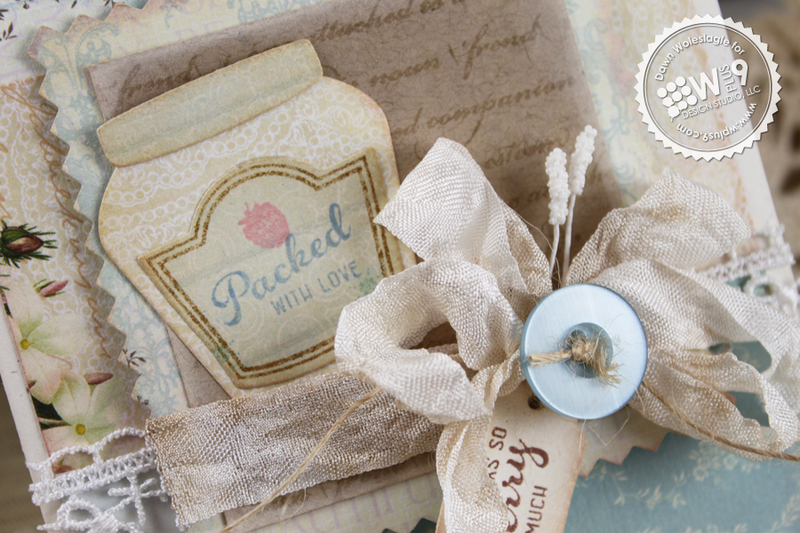 I am so happy to be able to bring you all the coordinating dies for this set! 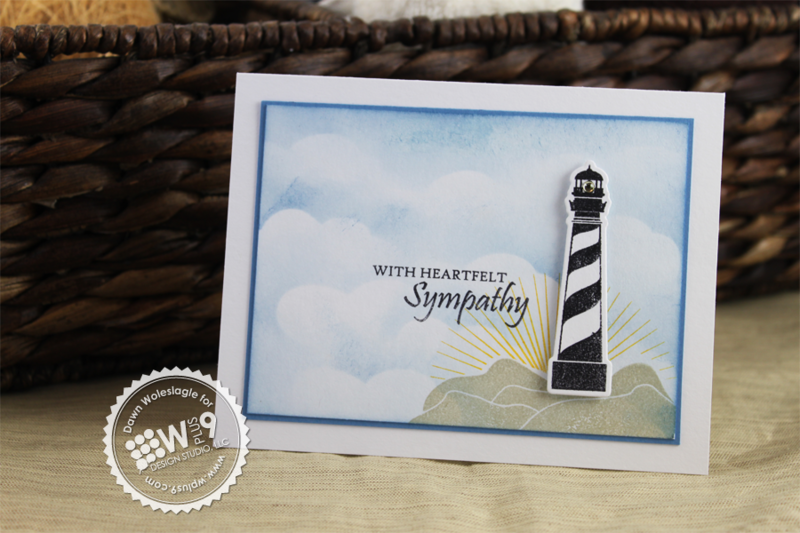 Here I've used the small lighthouse, and stamped it onto the die cut included in the Guiding Light Companion Die. I used the clouds from our Hearts & Clouds Die as a mask to sponge in my sky, and then added a sunburst from our Super Star stamp set. Not only are these a great companion to the stamp set, I wanted to show you how lovely some of the images can look when used alone. To create the background, I die cut several of the sand dollars and laid them out on a piece of Oatmeal cardstock to act as a mask. I sprayed the panel with some Tattered Angels Glimmer Mist in Sand lightly, removed a few of the sand dollars and sprayed again. I did this one more time to get some graduation in the shades in the background. 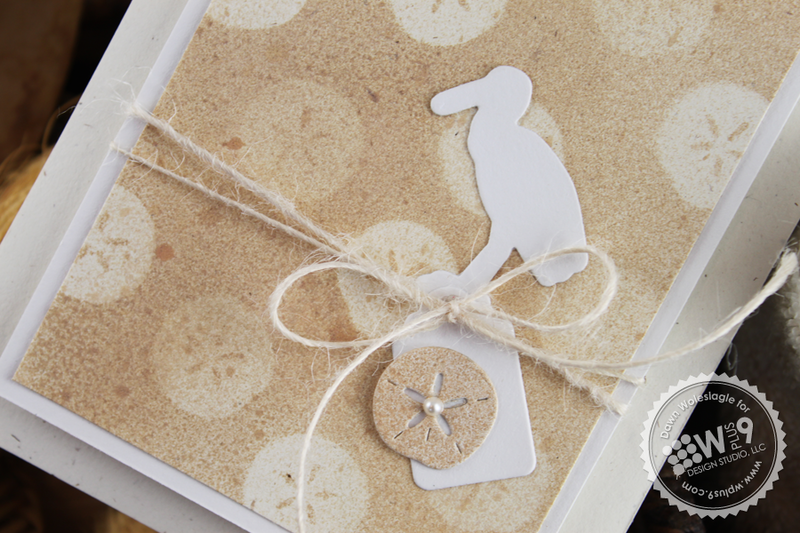 I added the Egret/Heron die cut and one of the misted sand dollars over a tag from Timeless Tags to finish it. That concludes today. Tomorrow is the full reveal, and the big giveaway! But, right now you can head over to the Design Team's blogs to see what they have shared with today's goodies. Would you like to win Fish More and the Fish More Companion Die, and Guiding Light and the Guiding Light Companion Die? Just leave me a comment by 9:00 AM EST June 4th to enter. I will select one random winner from all comments. Winners will be posted here. Welcome back! 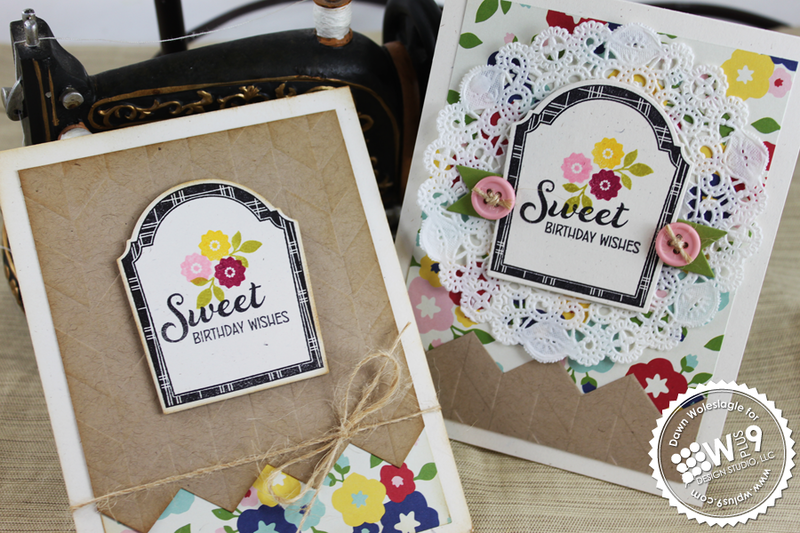 It's day 2 of our June/July Release and we have another sweet set and die to share with you. I am so glad to hear how much you all are enjoying the samples the Design Team and I have to share. If you are just joining us, you can catch up here. Today's set is a wonderfully complimentary set to Fresh Picked. 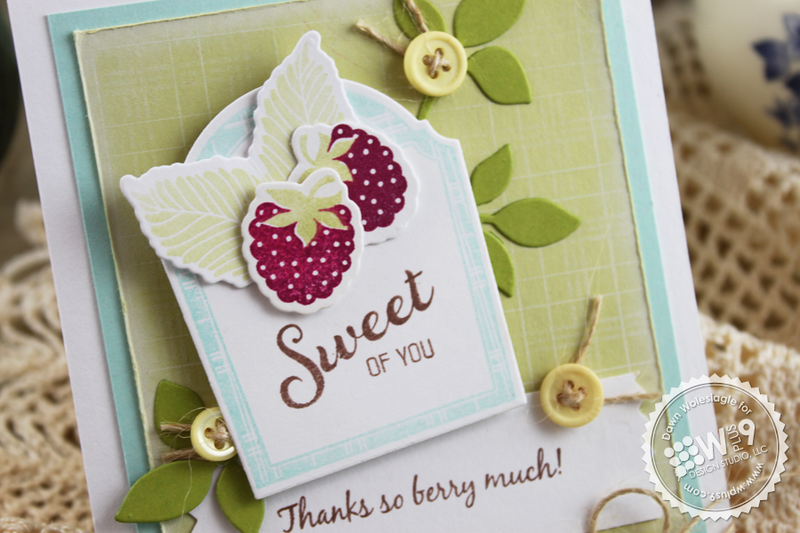 Still centered around berries and puns, but on a smaller scale. But don't worry, Fresh Preserves is still packed with fun. Fresh Preserves speaks loud and clear to the "country bumpkin" that lives deep, deep...deep...d.e.e.p. down inside of me. 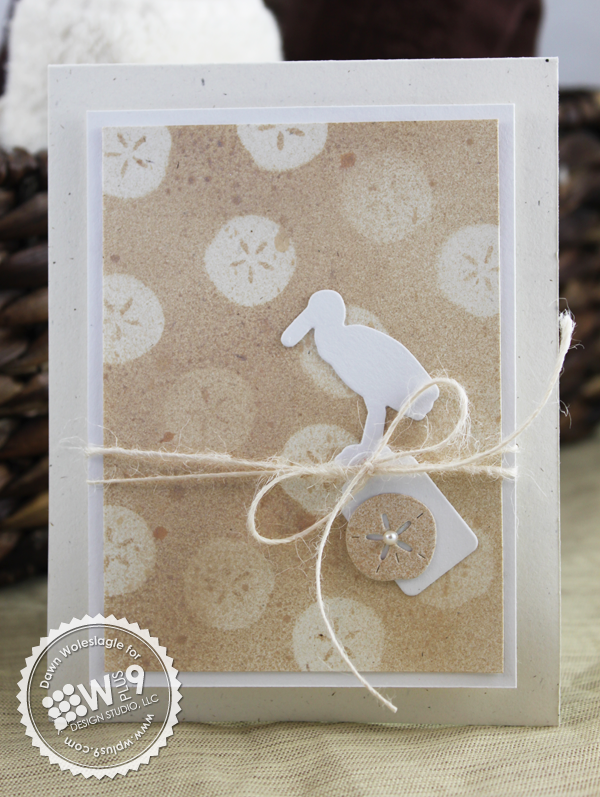 This is the perfect way to show off this cute stamp set and die! The wonderful thing about these products is that they can be used together or alone. Here, I've used them together. I die cut the jar and label and filled the little jar using the "filling" stamp included in Fresh Preserves. 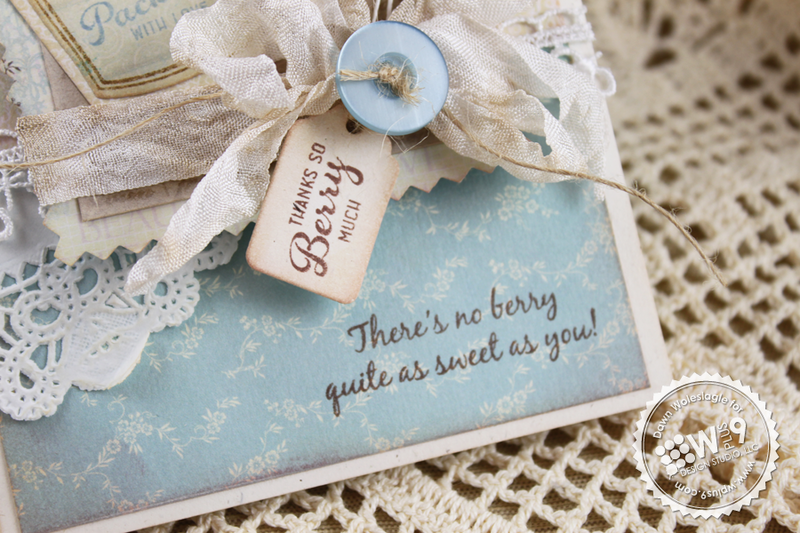 I then added the label and "Thanks so berry much" sentiment. 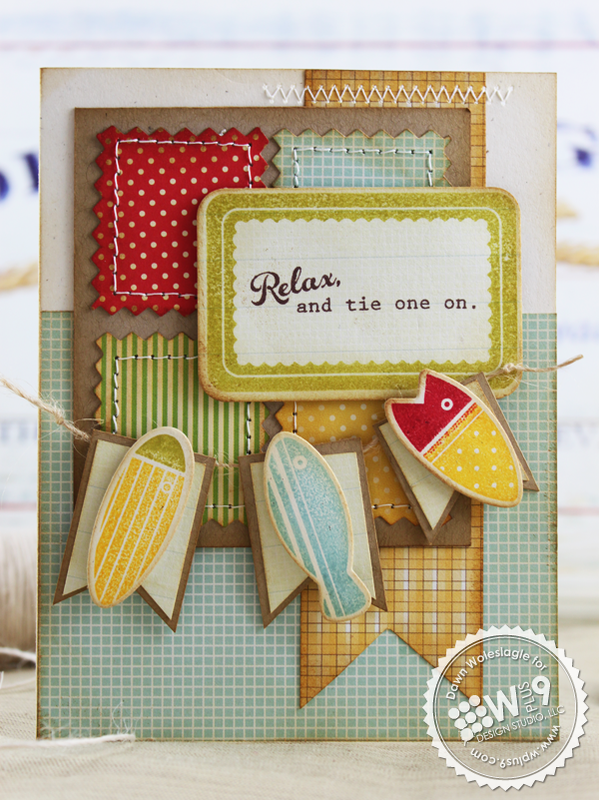 You'll find some of the same sentiments from Fresh Picked scaled to fit inside the label included in this set. This jar also has a lid, however, you could opt not to use it as I've done here. 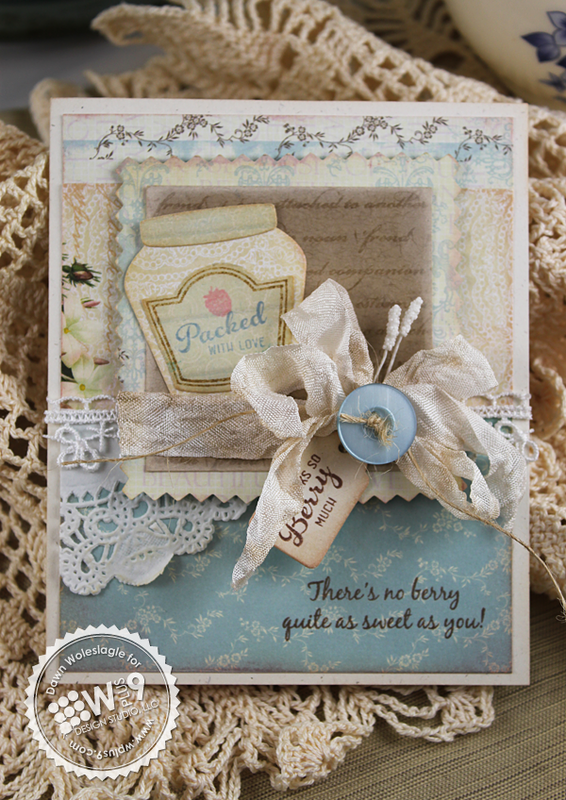 I've added cute little embossing to the rim to emulate the "threads" on the mouth of a jar. 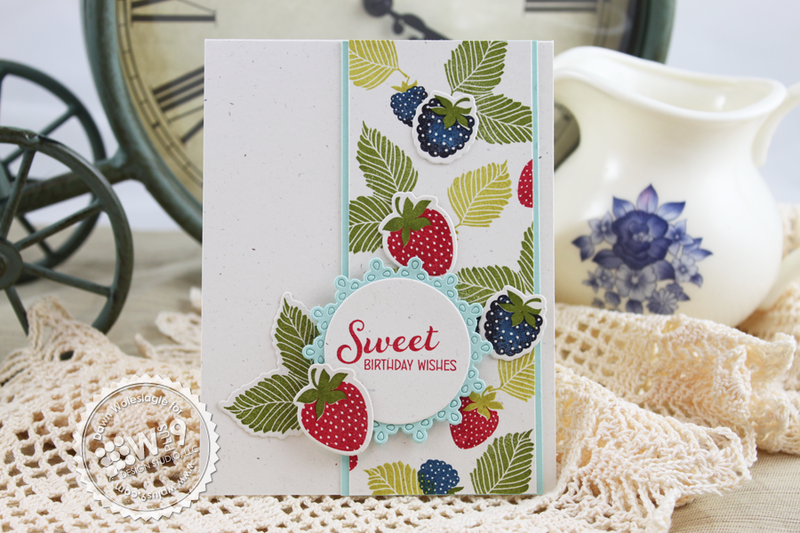 To create that old vintage looking patterned paper, I started by stamping the large strawberries and leaf cluster from Fresh Picked onto our Oatmeal cardstock. The flowers were added from Folk Art Florals in versamark, and then heat embossed using White Detail powder. To emphasize the flowers, I distressed the panel using Tim Holtz Distress Ink in Vintage Photo. 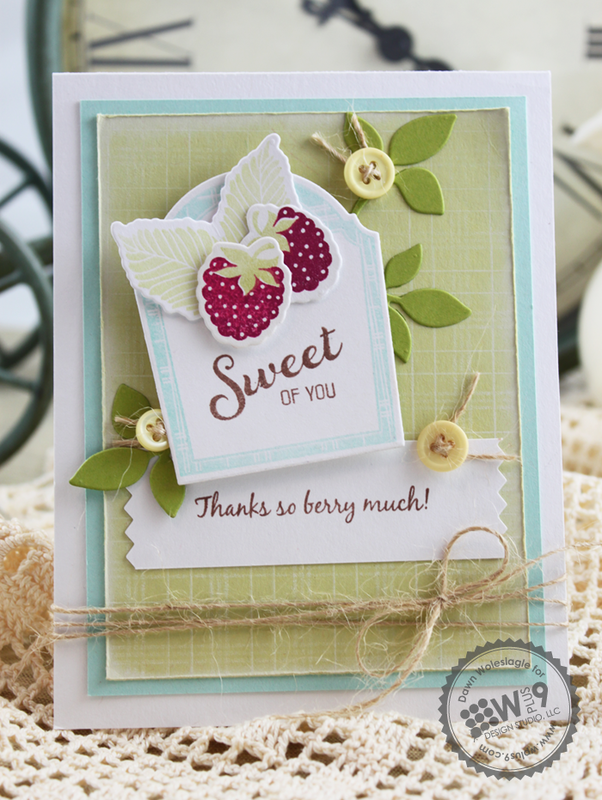 I added some embossing using the Chevron Impression Plate and the "You are just the sweetest!" sentiment from Fresh Picked, some stitching and some twine...done. And then, of course I was all feeling confident and decided to try some shabby-chic again. This set made it so easy! 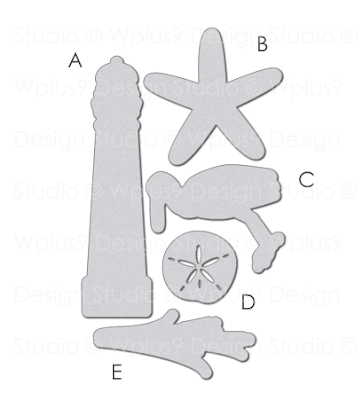 I loved die cutting the images from patterned paper. I used some beautiful Webster's Pages paper that Ms. Kerrianne Gwin gave me, and it was perfect for the job. Since all of the papers were so light, I wanted to give the jar a little something darker to rest on. I stamped a Kraft panel using Defining Words in Versamark. I added my sentiment and raspberry (both from Fresh Preserves) to the label by stamping off once. Ink the stamp, stamp once onto scratch paper, and then stamp onto your project without re-inking. This gives it that soft tone. 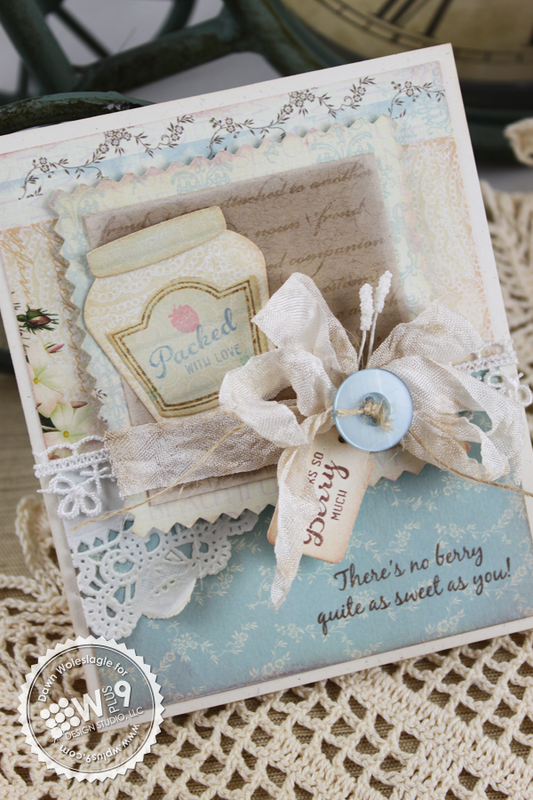 I added another little sentiment, also included in the set, to a little tag die cut with our Timeless Tags die. And stamped another sentiment from Fresh Picked in the corner. And because it wouldn't be shabby-chic without a ton of distressing and extra "stuff", I added some here and there! So, of course, you don't have to go all out. Sure it's fun. But a good, simple and graphic card is always nice to have. 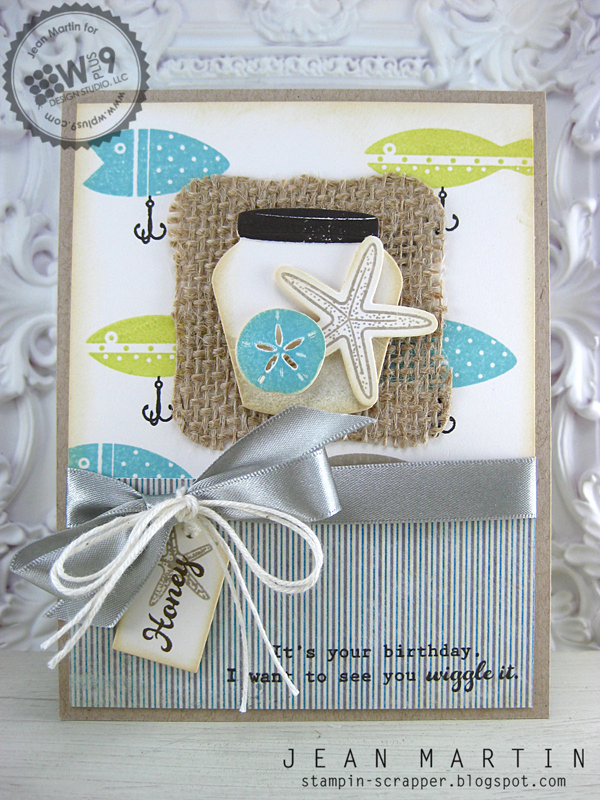 And much more cost effective for creating gift sets of cards. 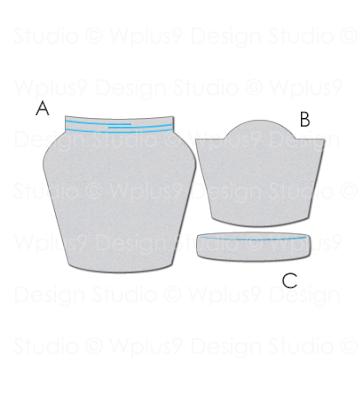 I've included an outline image of the jar in Fresh Preserves as well. 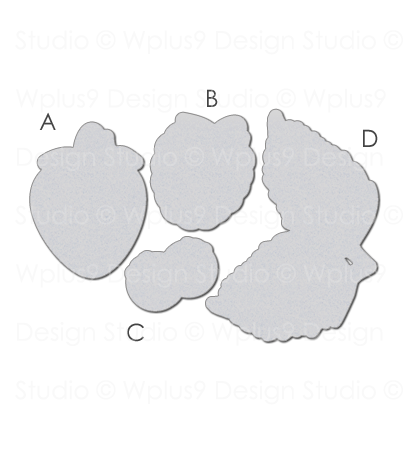 It is not sized to stamp onto the die cut. It is meant for creating one layer cards, or if you want to fill the jar with something (hint, hint) and color with copics. Super simple! 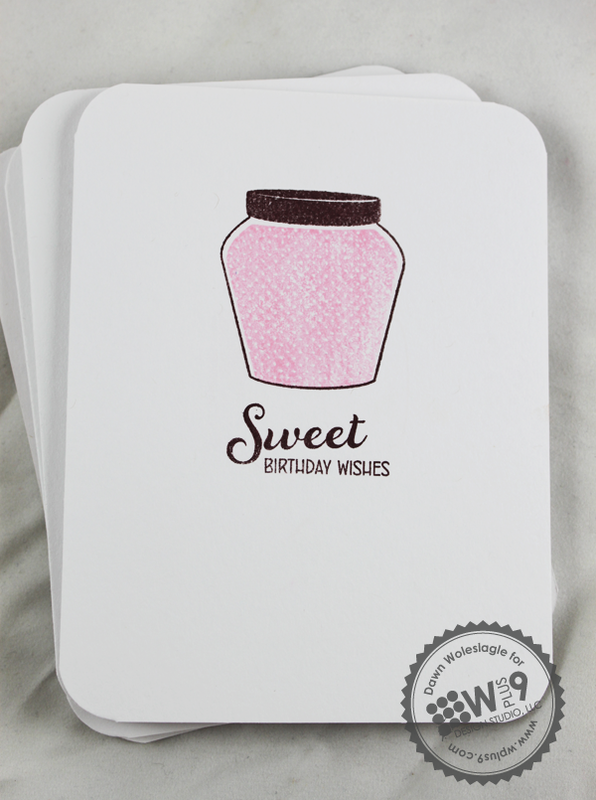 And it kind of reminds me of some of the letterpress cards...without the letterpress that is. That is all I have for today. But I will be back tomorrow with more! Anddon't forget to stop by the Design Team's blogs. They all have previews to share with you right now. Would you like to win Fresh Preserves and the Preserves Jar Die? 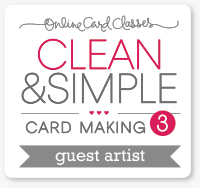 Just leave me a comment by 9:00 AM EST June 3rd to enter. I will select one random winner from all comments. Winners will be posted here. It's Release Week! For those of you that are new to Wplus9, we will spend the next couple of days getting up close and personal with the products that we will be releasing this month. All previewed items will be available for purchase on June 5th at www.wplus9.com. 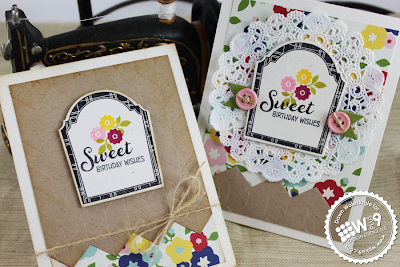 This month we will be introducing 3 new stamp sets and 5 new dies! And, the cherry on top? We have the insanely talented Cherry Nelson joining us as a Guest Designer. You are definitely in for a treat! With Summer knocking at our doors here in the US, I hope that you will find this release to be a wonderful way to welcome it. 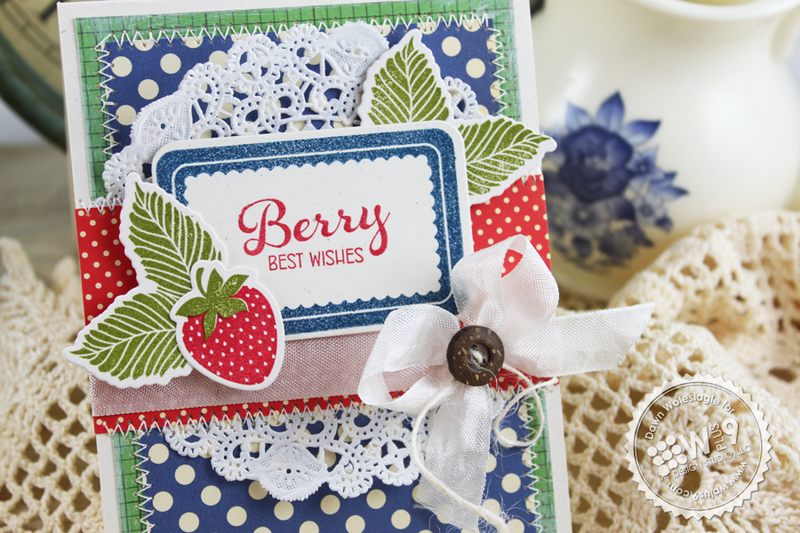 Today we are starting with a HOT trend, berries. We have a super sweet set packed with not just strawberries, but raspberries/blackberries and blueberries too! We don't discriminate. And, we have 2 coordinating dies to accompany it. Ready? Let's get started with the introductions then! 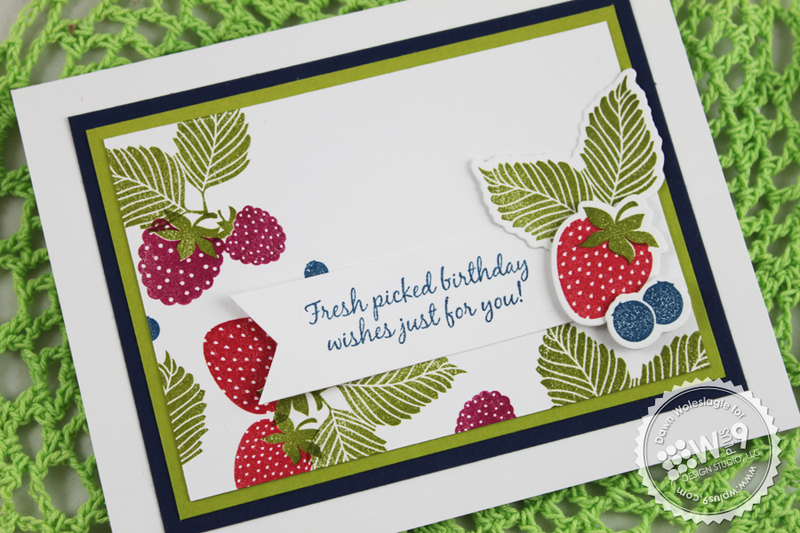 For my first card I wanted to showcase the large raspberries in the set. I just LOVE these little gems. The base and stem are separate, and super easy to line up. I find that the best way is to stamp the berry first and then add the stem. 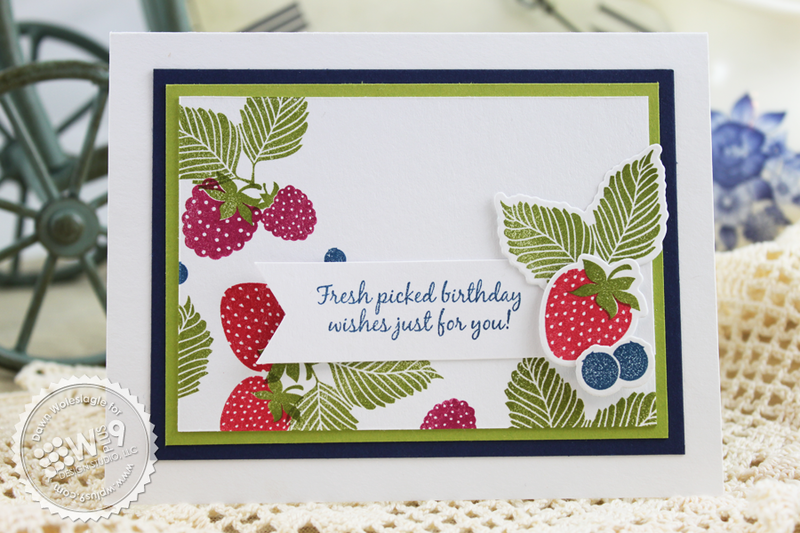 The Fresh Picked Companion Dies make layering the leaves and berries so easy! 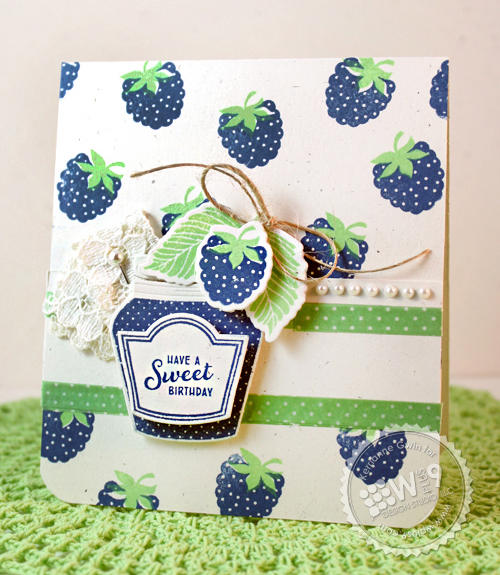 I used the frame from Fresh Picked along with the Label Layers 5 Die as a base for my little berry cluster. Label Layers 5 may just be my new favorite frame ever! It's gorgeous when paired with the matching stamp, as well as on it's own. 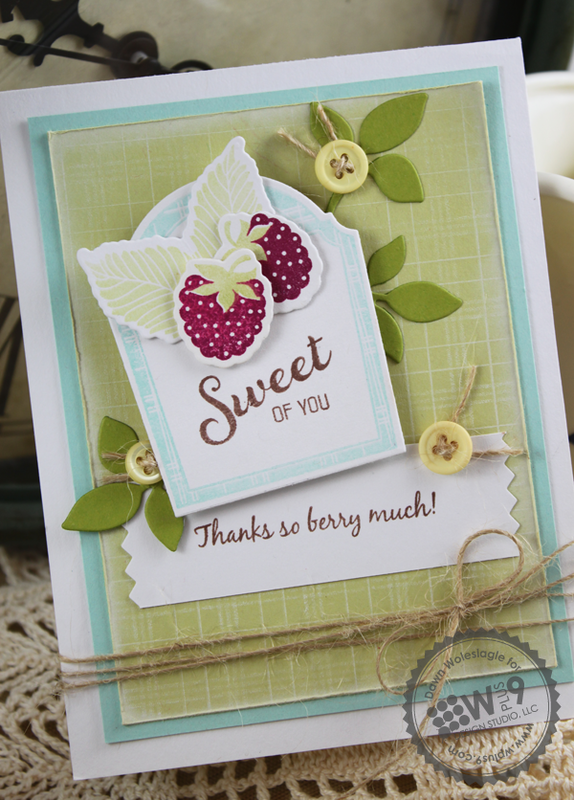 For my sentiments, I added the "Sweet of you" and "Thanks so berry much" sentiments, both included in Fresh Picked. A little extra embellishment using the Folk Art Florals Die adds the finishing touches. This time I chose to create a blackberry. The raspberry and blackberry are similar enough in shape to use one image for both. Here, I inked it first in Not Quite Navy ink (Stampin' Up! ), and then rolled the edges in black. I just love the depth this added. 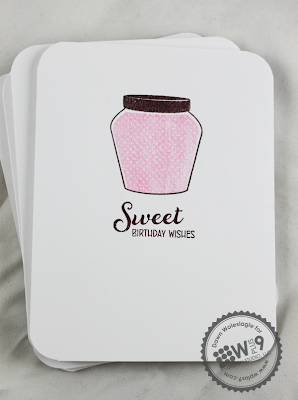 My sentiment "Sweet birthday wishes", was stamped onto our 1.75" circle and matted with the doily circle, both from our Circle Stackers 1 Die. 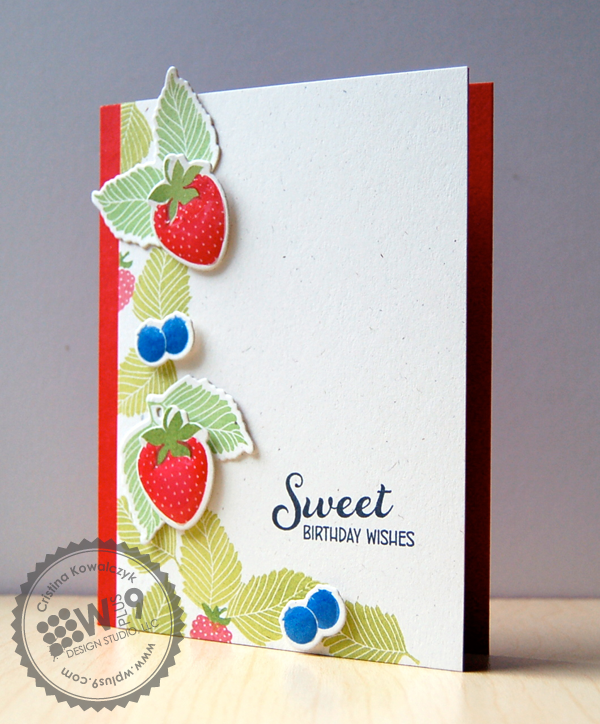 I added another die cut strawberry with leaves as an accent to complete this card. 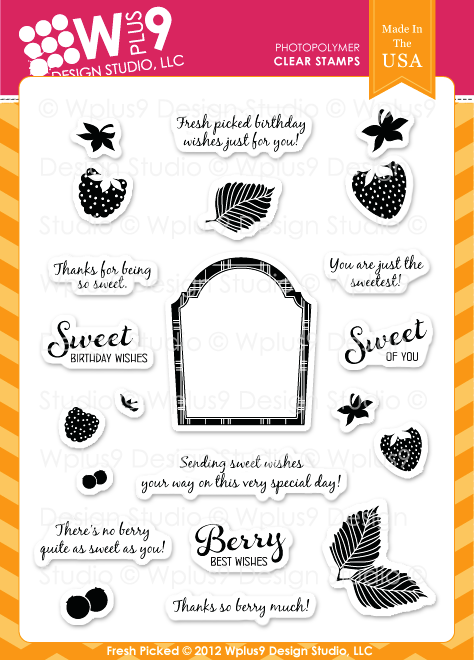 Next, I wanted to show you how well the large sentiments in Fresh Picked fit into some of our other Label Layers dies. 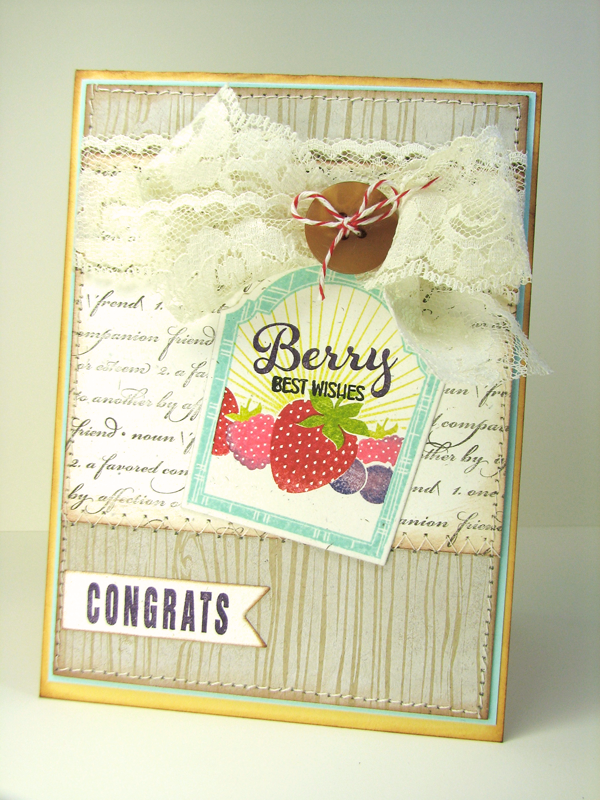 I die cut and stamped a label using Label Layers 4 Die and Label Layers 4 stamp set, and added the "Berry Best Wishes" sentiment included in Fresh Picked. 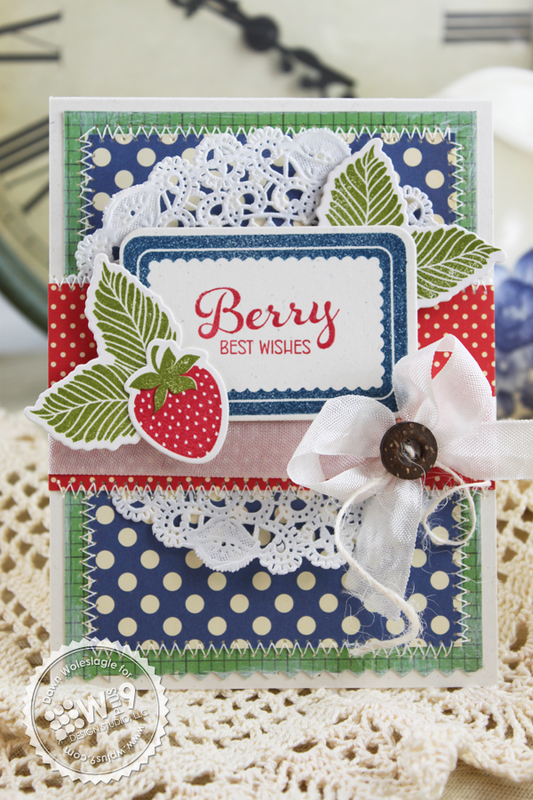 Add some October Afternoon patterned paper, stitching, and more die cut strawberry embellishments to a card base in White, and I call this one done. 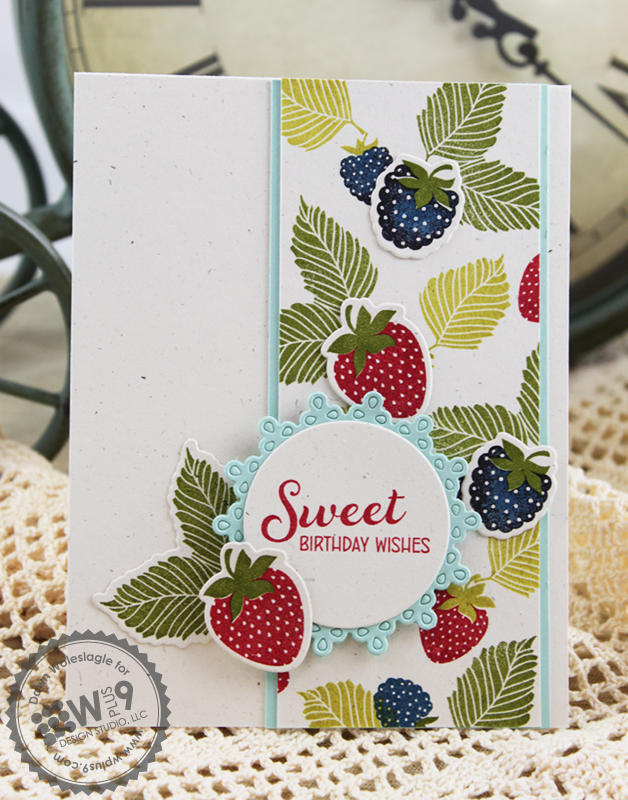 I used a similar color scheme as my earlier card, except I swapped the blackberries out for raspberries, and incorporated the blue by way of blueberries. I love how versatile this set is. You don't get stuck in one genre. The illustrations are classic enough that the set can be used in clean and simple styles as well as taken super shabby-chic. That sums it up for me today. But don't forget to stop by the Design Team's blogs. They all have a little something to share with you, and I've had the pleasure of sneaking a peek at some of them. Let me just say, WOW! 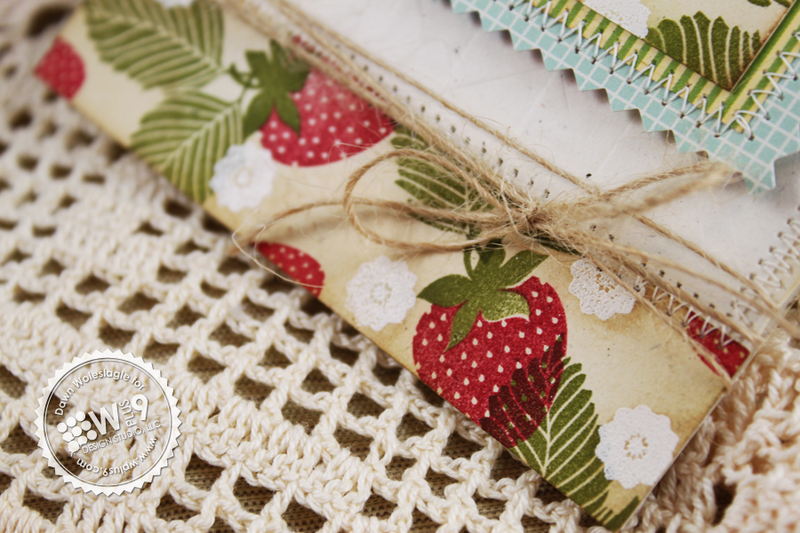 So, do you have room in your stash for these sweet little berries? 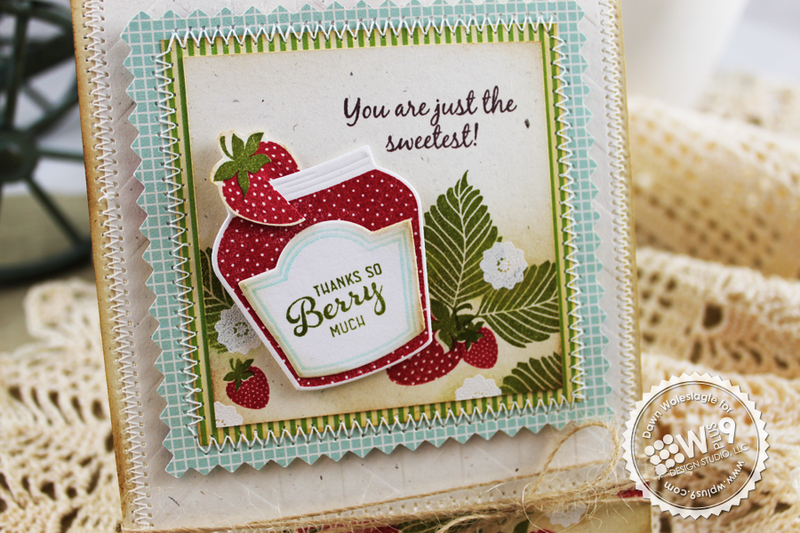 Would you like to win Fresh Picked, the Fresh Picked Companion Die, and the Label Layers 5 Die? Just leave me a comment by 9:00 AM EST June 2nd to enter. I will select one random winner from all comments. Winners will be posted here.